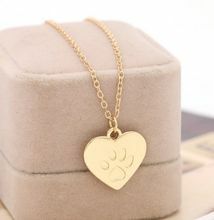 Give way to the simple charm of this Heart Shaped Paw Necklace! Chain length 50 cm/ 19.6 inch. Lovely paw necklace - was a gift for my friend a pet lover. She likes the gift and I could surprise her! I am sooo excited - didn't expect to get such a good quality stuff! thanks! I love this store - they packed attentively the item and I received it in a great condition.